Michael Bryce was the inaugural Patron of Good Design Australia. Michael is an architect and designer acknowledged in Australia and overseas for his distinguished work in graphic, urban and environmental design. He was born in Brisbane, started school in Gordonvale and was educated at Brisbane State High School and the University of Queensland. In 1968, he commenced his own architecture practice in Brisbane, developing a special interest in graphic design. From 1979 to 1983, he was Federal President of the Industrial Design Institute of Australia. He was also a member of the Design Board and the Design Council. His practice has won awards for graphic and environmental design, including the RAIA (QLD) Civic Design Award, the House of the Year Award, and the RAIA President’s Award. The practice has also received many citations in the print industry and Design Institute awards. In 1988, his practice joined the worldwide Minale Tattersfield Design Strategy Group with offices in London and Paris and clients worldwide including Harrods, San Pellegrino, FA Premier League, BNP, and the Eurostar train. Beginning in 1992, Michael Bryce became the principal design adviser to the Sydney 2000 Olympic Games, designing the Olympic bid logo and advising on the application of the corporate branding. His sport-related design work also includes graphics for the Brisbane 1982 Commonwealth Games and Expos ‘85 and ‘88. His sports logos have included the Australian 1996 Commonwealth Games team, the Dolphins Australian Swimming team, the Wallabies Rugby team, and the world cricket body, the ICC. He has been a board member of the Queensland (Symphony) Orchestra and Trustee of the Queensland Art Gallery, a Ministerial Adviser on the Child Accident Prevention Foundation and various product safety committees. He was Founding President of Melanoma Patients Australia. He has also been a volunteer with the State Emergency Service in Queensland. Following 5 years in the Air Training Corps he served as an Intelligence Officer in the Royal Australian Air Force Reserve from 1956 to 1970, including appointment as honorary Aide de Camp to the Governor of Queensland. He was awarded the Air Efficiency Award (AE) in 1970. He was patron of the RAAF Association in Queensland for some years and is now patron of the Combat Support Group Association. Mr Bryce is Patron of a number of community organisations and other arts related bodies. 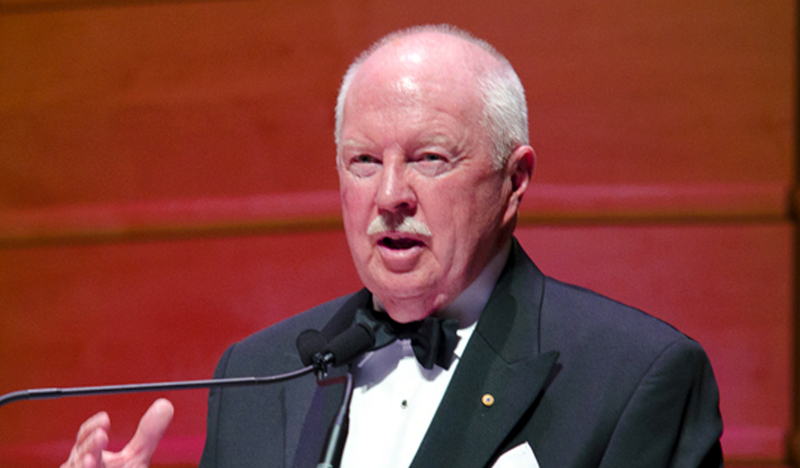 He has served as President of St John Ambulance [Qld] First Aid Services Division and was made a Knight of Justice in the Order of St John of Jerusalem (KStJ). In 2006, he was made a Member of the Order of Australia (AM) for services to the design profession and the community. He has had a long association with universities around Australia. He has taught and mentored young graduates and is committed to the expression of a distinctive Australian identity within an international framework. He has been awarded Honorary Doctorates by the Universities of Queensland and Canberra and is presently Adjunct Professor of Architecture and Design at the University of Canberra. Michael Bryce has been awarded Life Fellowships of the Royal Australian Institute of Architects and the Design Institute of Australia and is a Fellow of the Royal Society of Arts. In 2006, he was inducted into the Australian Design Hall of Fame. In September 2008 he retired from his practice upon the appointment of Ms Bryce as Governor-General of Australia. The practice he founded continues today as Minale Bryce Design Strategy. Michael and Quentin Bryce were married in 1964. They have two daughters and three sons, and ten grandchildren.